Dan Mason (7) of the Newtown Nighthawks finds plenty of running room during a game against the Bunnell Bulldogs on Oct. 26, 2018, at Bunnell High School in Stratford. The Darien Blue Wave has owned the CIAC Class LL tournament for the past three seasons. Three consecutive state championships, nine straight playoff victories, and, adding in a couple of Class L years, five straight appearances in the finals. So what’s the secret recipe which has helped keep the Wave going with the short prep time between tournament games? No. 6 Darien (9-1) will begin its bid for a fourth straight state championship when it plays at the No. 3 Newtown Nighthawks (10-0) in the Class LL quarterfinals at 6:30 p.m., Tuesday, at Blue and Gold Stadium in Newtown. The Nighthawks wrapped up an SWC championship and their fifth unbeaten regular season in the past 10 years with a 21-14 win over Masuk last Wednesday and, like Trifone, head coach Bobby Pattison said the quick turnaround to playoff games is a mental battle. It’s a loaded tournament field. 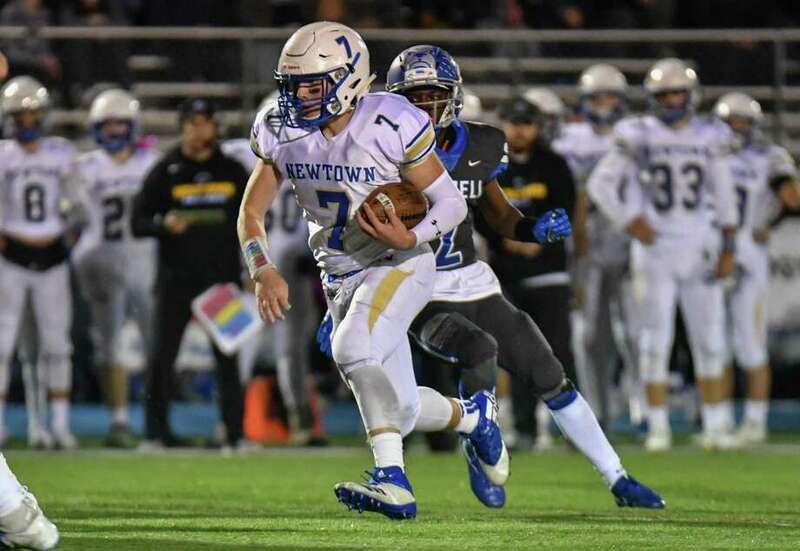 Newtown is one of four 10-0 teams; Darien leads a group of three 9-1 teams; and the one team at 8-2 in New Canaan, which has won eight state titles since 2006. The eventual champion will have earned its keep. Darien is in a familiar spot, albeit somewhat unwanted, as for the second straight year, it lost to rival New Canaan 17-14 in the Turkey Bowl on Thanksgiving. Last year, the Wave rebounded to defeat East Hartford, West Haven and Greenwich for the Class LL crown. Newtown is as tough a first-round opponent as the Wave has seen. The Nighthawks have outscored their opponents by a 424-50 margin and, prior to the win over Masuk, had won every game by at least 21 points. The offense features senior co-captain Dan Mason, a 6-foot, 220-pound running back who has racked up more than 1,200 rushing yards and scored 27 touchdowns this year. He’s topped 125 rushing yards six times, and had 132 yards on 23 carries in the win over Masuk. Senior quarterback Luke Melillo has had a solid season with 1,316 passing yards and 10 touchdowns against just two picks. Senior linebacker Easton Ricks (6-0, 185) leads the Newtown defense, which also features senior co-captains Max DuBois (6-2, 200) at linebacker and Joe Pagett (5-9, 175) at strong safety. Linebacker James Dunn (6-3, 220) and DE James Knox (6-4, 230) (both juniors) are also key play-makers. While Newtown has limited opponents to 50 points, Darien’s defense isn’t far off that mark, as the Wave has allowed just 78 points. Darien’s defense features a linebacking corps of senior co-captain Connor Fay (6-0, 215) and juniors Sam Wilson (5-10, 185) and John Henry Slonieski (5-10, 170), along with senior DE Alex Quirk (6-4. 205), and senior DT John Lochtefeld (6-0, 170). Senior QB Cooper Hancock has nearly 1,900 passing yards with 19 TDs and seven interceptions, with senior receivers Will Rolapp (43 receptions, 570 yards, 6 TDs), Peter Bredahl (28 catches, 418 yards, 6 TDs), and Tyler Herget (32 receptions, 396 yards, 3 TDs) as his top targets. Junior Will Kirby and senior Andrew Lucas lead the ground game. Limiting mistakes has served Darien well during it’s three-year reign as state champions and will need to continue that trend if it wants to overcome a Newtown team which has handled every opponent so far this season.